Dental radiographs are an essential part of dentistry because they allow your chosen practice to see below the surface of teeth and gums to areas that the naked eye simply can’t access. From these images, Dr. Tran can diagnose problems like tooth decay, gum disease, bone infections, dental abnormalities, and more at early stages, helping you maintain a higher level of oral health throughout the years. 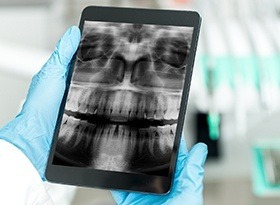 At Covina Family Dental, our team is proud to now offer digital X-rays as a safe, convenient, and precise diagnostic tool that is superior to traditional film in countless ways. Although X-rays are generally not considered to be part of any medical routine, some patients need X-rays on a regular basis to monitor certain dental conditions. Children may require more frequent X-rays than most adults, as their teeth and jaw are still developing. New patients will likely need X-rays in order to identify the status of their oral health and evaluate further development. Dr. Tran can determine the best procedures to treat any issues found with X-rays. Call (626) 331-0688 today to schedule your next appointment.